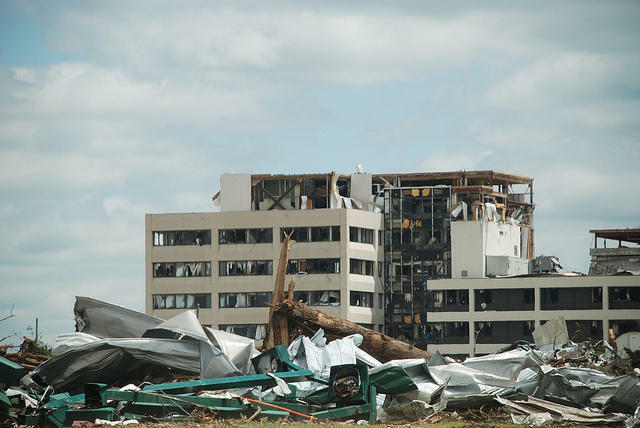 A photo of the St. John's Regional Medical Center in Joplin shortly after it was damaged by an EF-5 tornado in 2011. A new Joplin hospital that replaces one destroyed by a deadly tornado is opening its doors to patients Sunday. The $465 million Mercy Hospital Joplin features 205 private rooms and features that will make it better able to withstand another disaster. Builders say critical areas of the hospital, such as the emergency department and intensive care unit, have windows rated to withstand 250 mph winds. The facility replaces St. John's Regional Medical Center. The hospital was knocked 4 inches off its foundation in the May 2011 EF-5 twister. Five patients and one visitor were among the 161 people killed. Two years to the day that an EF-5 tornado ripped through Joplin, killing 161 people, the city was greeted with near perfect weather, as thousands came out Wednesday to honor the lives of those lost, and reflect upon the continuing recovery effort.